I could not live without sweets. Seriously. I love desserts and can not pass off a meal without having one. There is a certain restaurant in Kapitolyo that I frequent for their delicious cakes for a very affordable price. I'll give you a hint: one of their trademark products is Avocado cake. 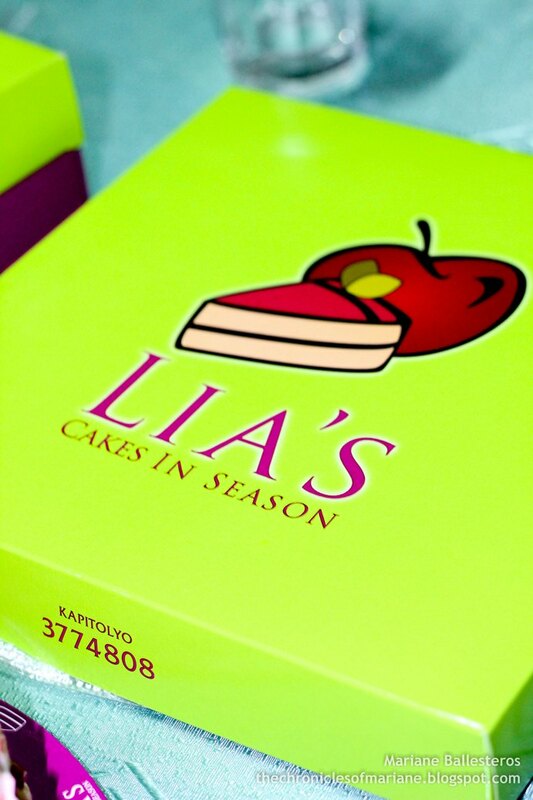 Yes, I am talking about no other than Lia's Cakes in Season! 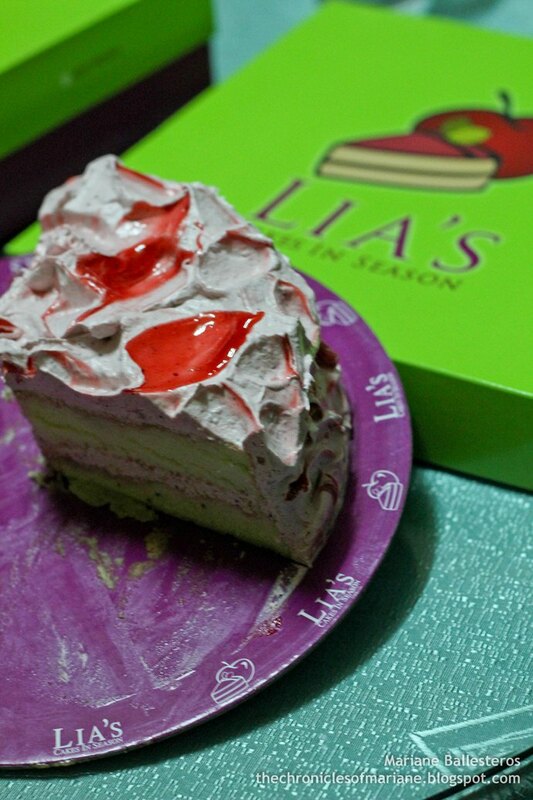 I remember that my first ever taste of Lia's Cakes was during an officemate's birthday party. My first reaction was "Serious? Avocado in a cake?" 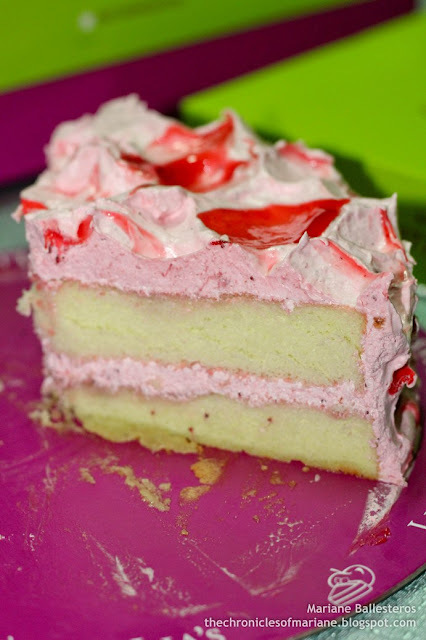 I was hesitant to try it at first but all of my doubts about this cake were erased as soon as I had my first bite. Oh boy, it really was good! I have now been to their place at Kapitolyo for more than 5 times now, and to think that I live in Caloocan, I really make an effort just to buy their cakes! So on our latest trip to Kapitolyo, I finally had my camera with me and decided to take some pictures. 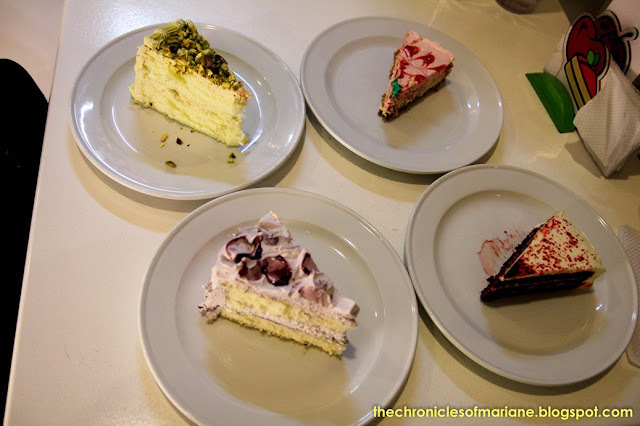 I usually go with a friend and order 3-5 slices of different cakes that we could share so that we could also try different flavors that they offer. The staff of the place were really nice, polite and prompt. Our order was served after 3-5 minutes since there were only few people dining when we went that time. The place was a bit small so it might be a problem if you're with a big group. 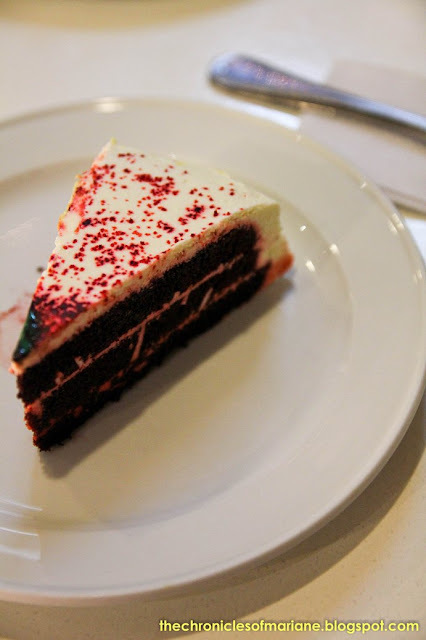 Red velvet Cake (Php60/slice, Php450/whole) - This one was probably our least favorite, NOT because it tasted bad or anything, it's because it tasted like how any red velvet cake should taste like. Just the right amount of saltiness that would be perfect for those who are really not into sweets but wants to indulge on desserts. It was also a bit dry for me though but fans of red velvet would probably love it. 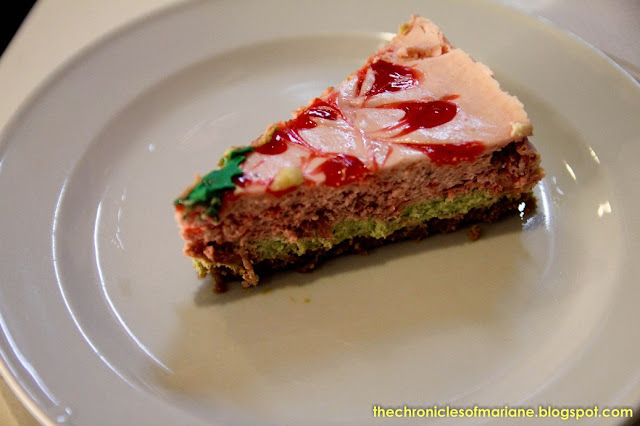 Strawberry Cheesecake (Php95/slice, Php590/whole) For me, the cheesecake had a hint of avocado in it. However, I like the mixture of sweetness of the strawberry and the avocado taste was perfect! I am not sure if it would be a hit with everyone but I, for sure, liked it! I will probably have this again on my next visit. 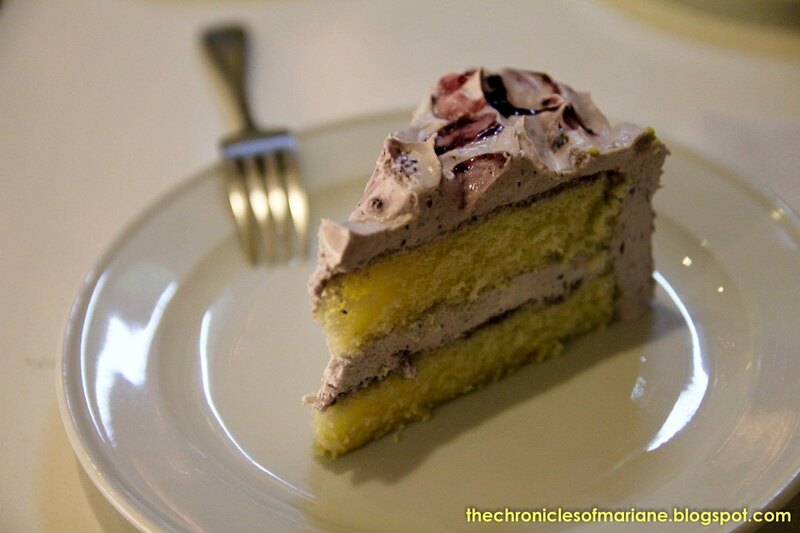 Blueberry Cream (Php65/slice, Php520/whole) - This cake is full of icing, but in a good way. 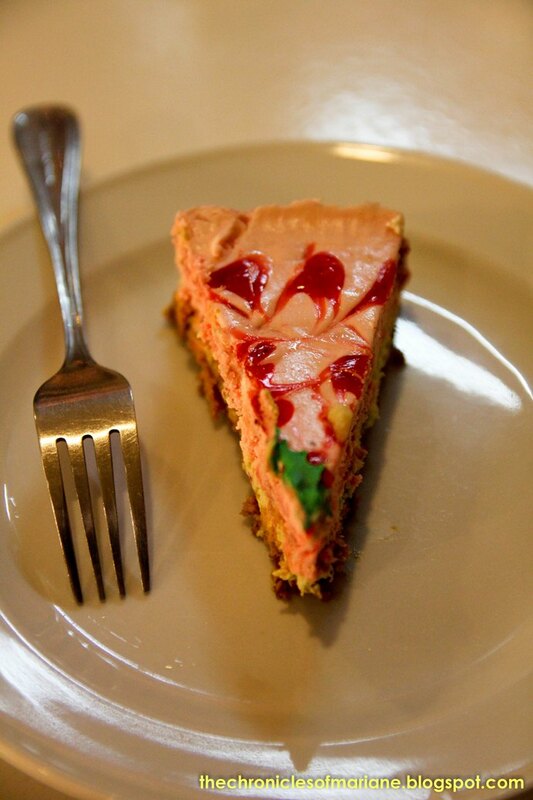 It's not the type that would make you umay after finishing one slice. I think the amount of icing blends well with the lightness of the chiffon cake. 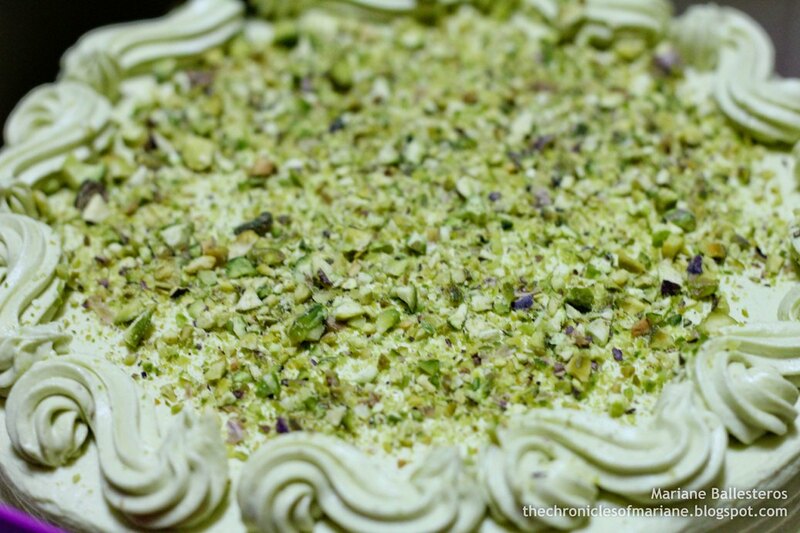 It's so creamy and has just the right amount of sweetness! However, comparing with the Strawberry Cream that I also had before, I think the taste of the blueberry wasn't that evident compared to the strawberry taste. 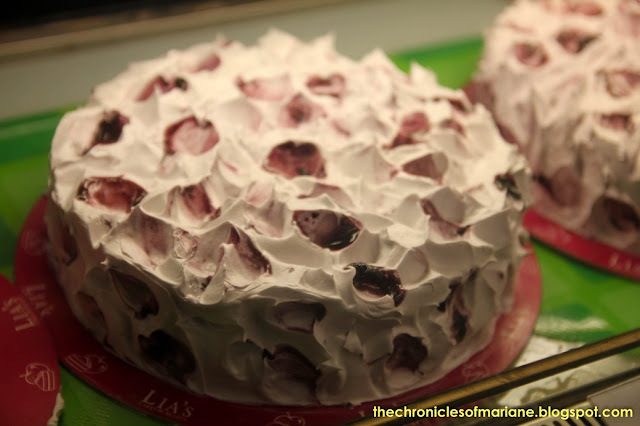 Strawberries and Cream (Php65/slice, Php520/whole) - The texture of the cake is the same with the Blueberry Cream cake, both have generous amounts of icing that doesn't taste buttery at all. 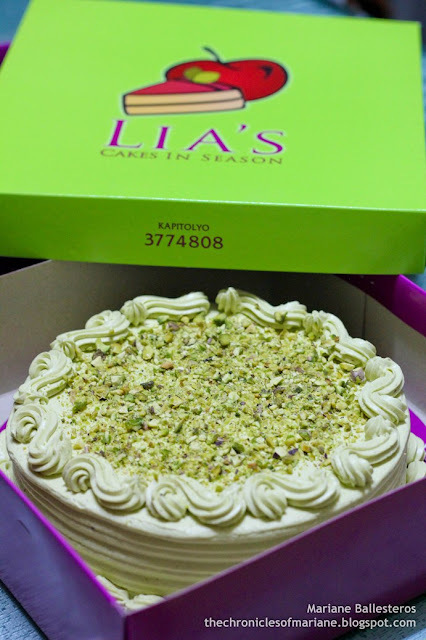 I usually order this one every time I visit Lia's as for me this is the sweetest cake they have. Though it isn't really sweet to the point compared to those cakes wherein you'd want to brush your teeth after eating it or you feel like you'll be having diabetes after (you know that feeling! haha) For me, this one of my favorites, because it's very affordable too. 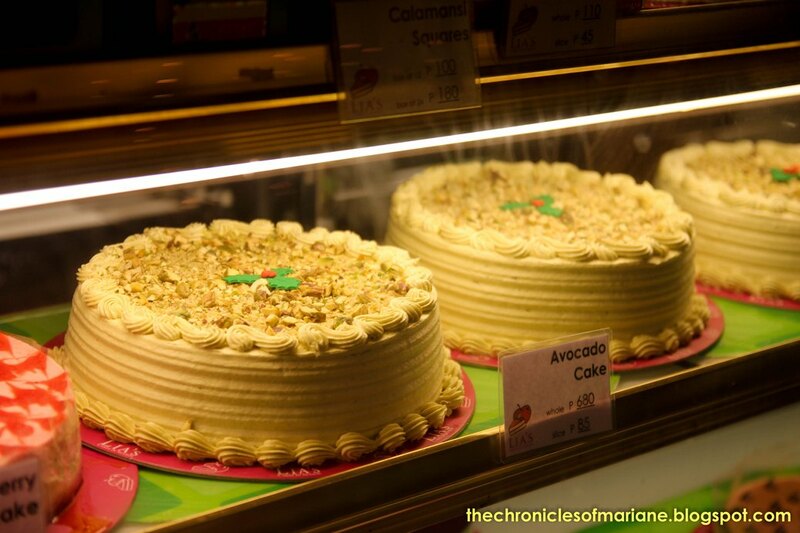 Avocado Cake (Php85/slice, Php680/whole) - Their avocado cake is very simple and straightforward. 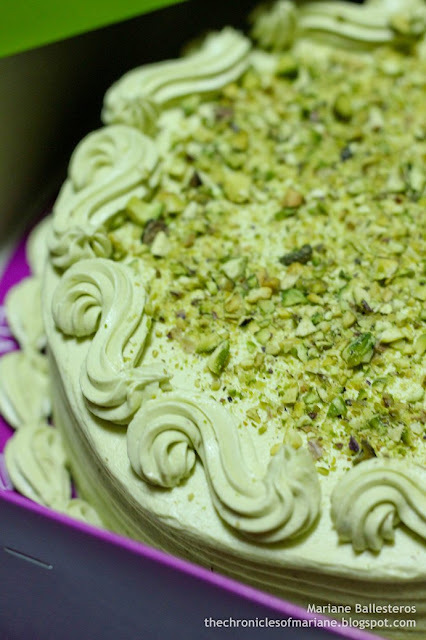 Just by looking at it, the pistachio nuts on top are enough to tempt you. But wait, you ask yourself, "Do I really like how avocado tastes like?" I tell you, you have to try it! There's no reason for you to back out too since it's price is very affordable at 85 pesos per slice. 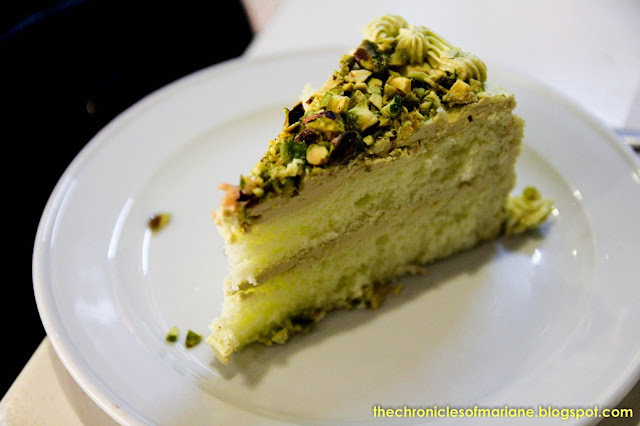 Their trademark cake has green chiffon in it that has the same fluffiness as their Strawberry/Blueberry Cream Cake. The icing has just the right mix of avocado sweetness and saltiness from the butter, and to top it off, the generously chopped pistachio nuts and avocado bits just makes the taste even better. 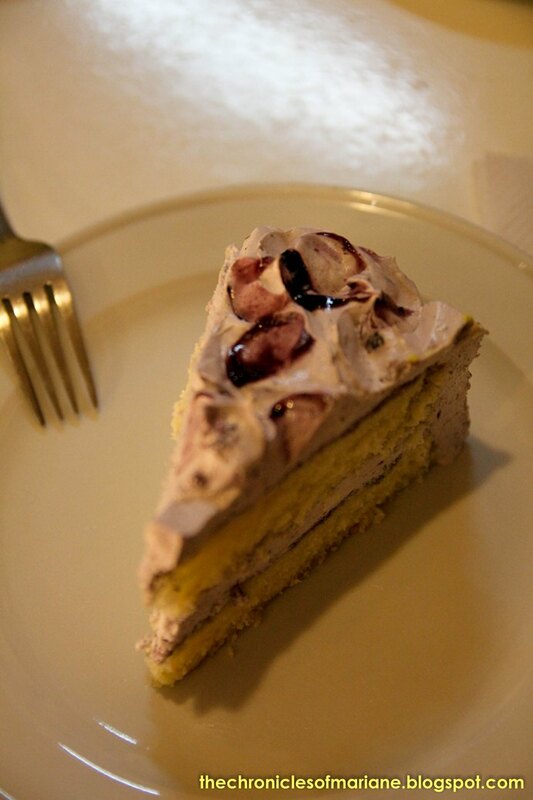 I think it's also perfect for people who want to eat desserts that are not that sweet. 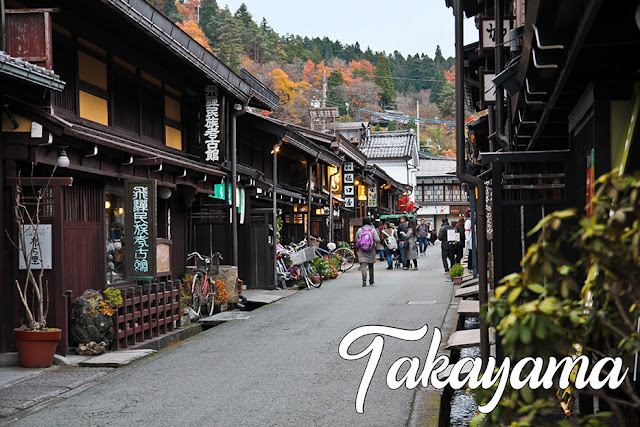 Ambiance/Staff: 4 - The staff were really nice but I thought the place was also small. 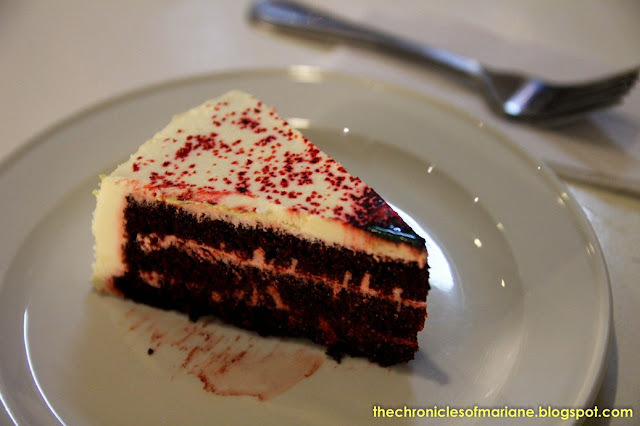 Food: 5 - What more can I say? LOVED IT! Price: 4 - Changing my score as we visited just last Mat 2014 and found out the price changed drastically :( Most of the cakes are now priced for over a hundred per slice. 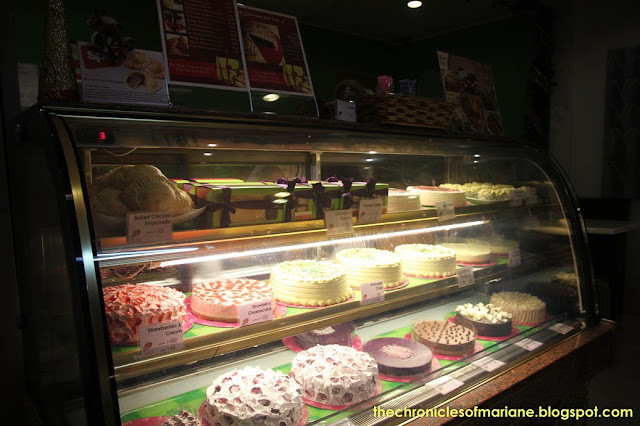 I already have a list of cakes that I want to try the next time I drop by again at Kapitolyo. 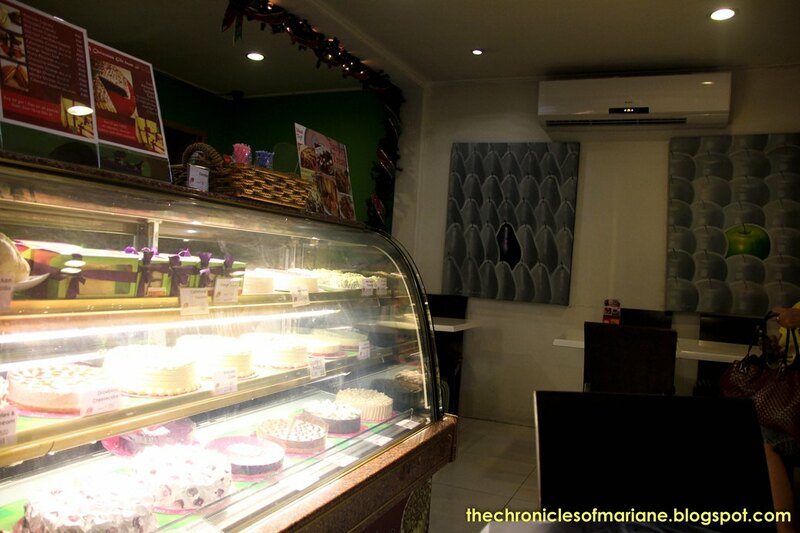 I have heard good reviews on their Calamansi Tea Cake and Mango Walnut that I have not really seen yet as I usually drop by here at night (maybe they're already sold out by evening). 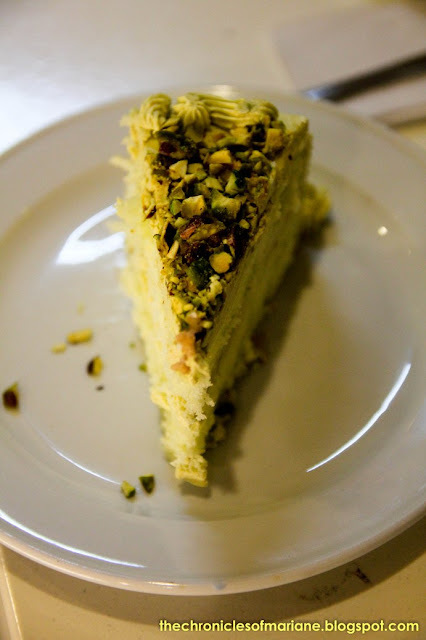 Having a bite of their Sugarfree Avocado Cake would probably nice as well, seeing as to how I can probably finish one cake all by myself. 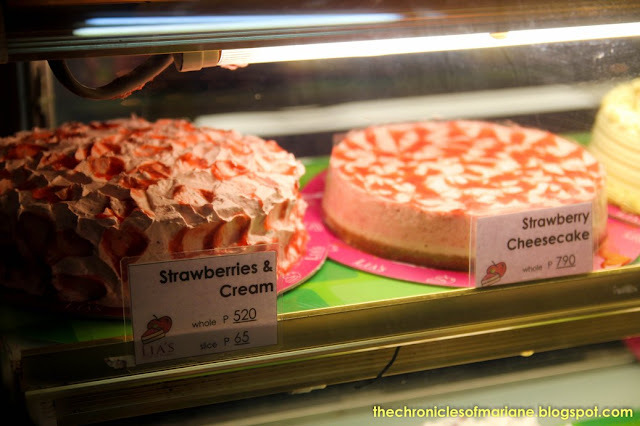 lol Also, I remember they used to have this promo way back wherein the cakes would be 30% off by 8 PM onwards, I just wish they would have the same promotion again, I'd be the first one to go! 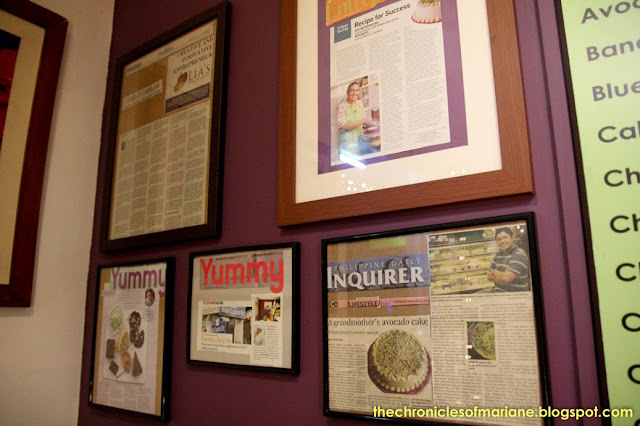 yep, you should try super sarap!